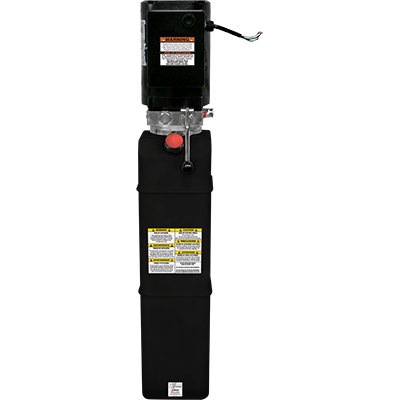 A large, 16 L (4.2-gallon) tank, 2.5 HP single-phase motor and 2,650 psi threshold on the pressure relief valve make for an incredibly versatile hydraulic power unit capable of servicing almost every car lift we make. The complete value of a hydraulic power pack made by Ranger Products can’t be totally measured by the specifications of the motor, hydraulic reservoir, etc. The design of every hydraulic power unit we make is comprehensively optimised for mechanical and volumetric efficiency. Our units produce a low noise level and are safely enclosed in a weather-safe casing, making them serviceable in humid and/or dusty environments. This unit’s 4.2-gallon tank is a little bigger than some in our collections, making it great for both extended-height ​lifts and heavier lifting applications. You can also put this baby on a low-rise lift and watch how fast it flies. We know that sounds fun, and it’s absolutely safe to do so. We utilise simple “power up” and “gravity down” ascents and descents, ensuring no more electricity is used than absolutely necessary during operation. Of course, the 2,650 PSI pressure relief valve is there to keep lifting safe in case your unit experiences stress beyond normal operating parameters. A Ranger hydraulic power unit is made to last the lifespan of a BendPak car ​lift, and a comprehensive one-year warranty on each unit attests to the confidence we have in our power units. Fun fact: our power units are capable of operating in -25 – 79°​C, which covers virtually every hospitable climate on earth (with maybe a few exceptions). When you’re serious about a hydraulic power pack that won’t let you down, Ranger Products has the best power units in the industry. Even if you’ve bought from BendPak / Ranger in the past, we highly recommend calling our customer service department before making a final decision on a hydraulic power unit. Totally enclosed motors are suitable for use in humid environments or dusty, contaminated atmospheres. UL Recognised and CSA Certified* AC electric motors feature heavy gauge steel frame and base and high-quality ball bearings.